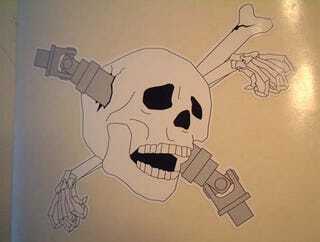 Life Imitates Art, or Something: Getcher Driveshaft-Through-Skull Warning Decals! The decals are about 5" by 4" and die-cut around the edges, and they've been printed with Mr. Canada's approval- no worries about him coming after you for some South Carolina-style royalty-payment collection! The price is $4 per sticker, including shipping (they're actually being sold at a small loss, but the hope is that the second batch will be cheaper to print). So here's the deal: If you want one of these stickers mailed to you in a nice padded envelope, contact SRekaugh here and work out the details with him.